The Symbol AP650 has been discontinued. No direct replacement is available. The Symbol AP650 is a thin multi-purpose access point designed to lower the cost of deploying and operating a secure, reliable 802.11n wireless LAN (WLAN) in branch offices or headquarters facilities. The AP650 combines simultaneous WLAN access and sensing, providing 24x7 wireless security and enabling IT administrators to remotely troubleshooting network performance issues at any location. The AP650 is designed to optimize network availability through its central and pre-emptive intelligence which dynamically senses weak or failing signals, securely moves mobile users to alternate APs, and boosts signal power to ensure uninterrupted access. Common problems, often seen with other products on the market such as building attenuation, electronic interference or sub-optimal access point placement are minimized, as SMART RF automatically optimizes power and channel selection allowing users high-quality wireless access and mobility. 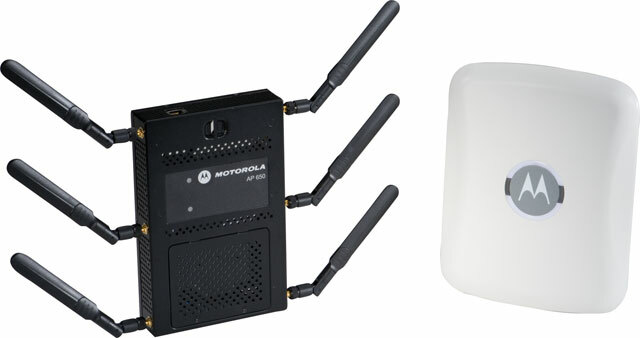 The Motorola AP650 is a very cost effective option for a high performance, 802.11n capable access point. Be it an office, school campus, or a retail business, the AP650 provides all the security and performance of more costly units in a compact design. If you are already using a Motorola RFS switch, the AP650 is easily integrated and immediately recognized. However, you can have the unit as a standalone access points as well. Even though it has a similar size as Netgear and Linksys devices, the AP650 greatly out performs any consumer device. If you need to expand your existing network or want one with professional security and features, the AP650 is a very easy and cost effective way to get there.